Some technologies become so ubiquitous that it is hard to imagine what life would be like without them. For most citizens of New Angeles, the Network is always there. Users order food, pay for products, and find love—or at least company—all without leaving the Network. Young people who have grown up in the fully connected world incorporate the Network seamlessly into their daily lives, filtering between PAD holograms, the physical world, and augmented reality as it suits their needs. At the heart of the Network underground are runners: users who grew up on the Net and know it better than the people who made it. Any serious runner uses a brain machine interface to get online and a whole suite of tricks to hide their real identity and location. Once they're jacked in, runners use code tools and raid vulnerable businesses, breaking into digital systems for profit, fun, and challenge. 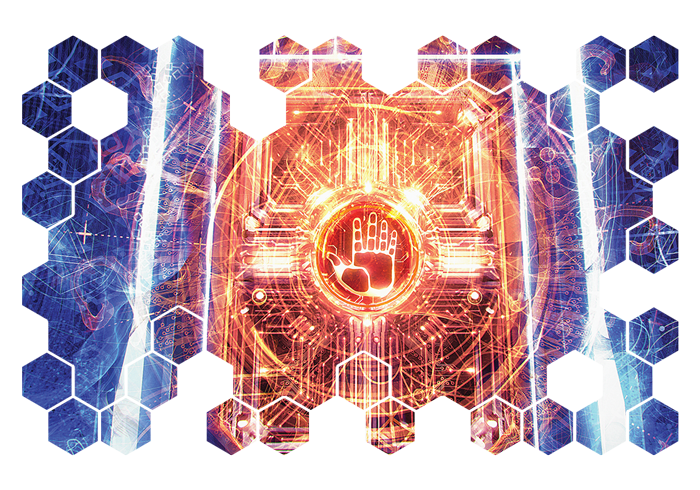 The Net is the most prolific technology in New Angeles, and those who can manipulate or defend it hold untold power. 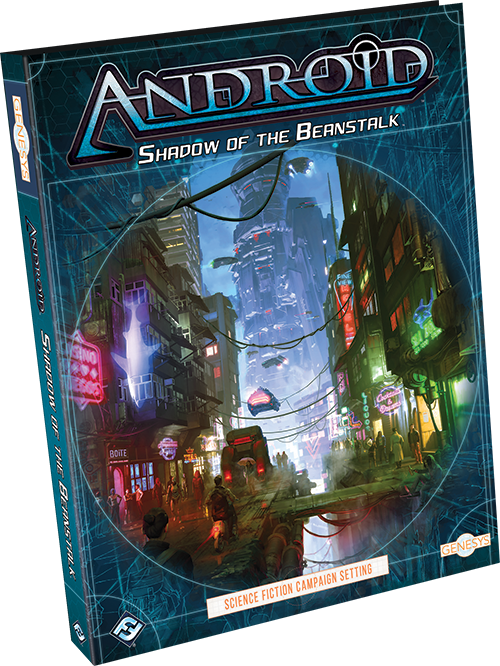 Join us today as we preview the rules for running the Net in Shadow of the Beanstalk, an Android sourcebook for Genesys Roleplaying! 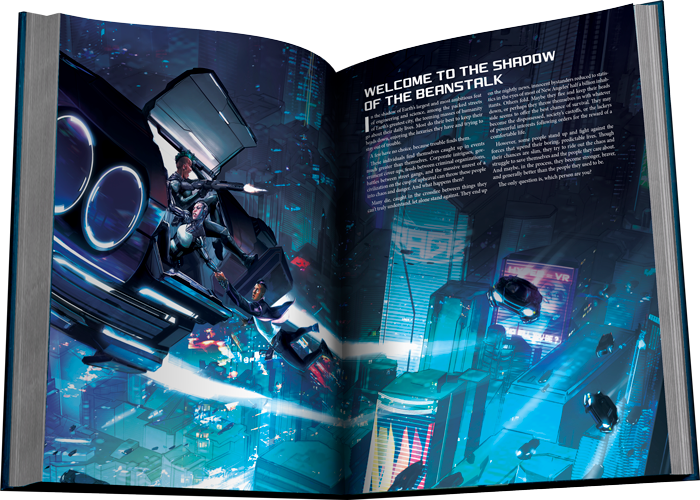 The Network rules used in Shadow of the Beanstalk offer a significantly expanded version of the hacking rules originally found in the Genesys Core Rulebook. While the fundamentals of hacking are the same, the Network encounter rules have been expanded and revised to reflect the greater complexity of the Net in Android. Though it is structured like a physical encounter, Network-based encounters are a little more abstract, as runners sift digitally through servers, systems, and sub-systems. Still, making a run works within the same framework as any other encounter in Genesys—with rounds, turns, actions, and maneuvers. A run can be broken down into two steps: accessing a system and telling that system to do something. These systems could range from a basic operating system for a door to the security system for an entire building! To get into these systems, a runner must first gain access to the system by making a Computers (Hacking) check. Of course, the difficulty of accessing these systems depends on their security measures. Of course, gaining access to the system is only the first step, and once you’re in, the hard work begins. Once a runner is in the system, they have access to the sub-systems held within. These sub-systems each have specific purposes: if the overall system is building security, one sub-system might control the cameras, while another controls the alarm. Runners can shift their attention between various sub-systems with an incidental action, but while this allows you to waltz into some sub-systems and use an Enact Command action to control it, other sub-systems have more specialized defenses. 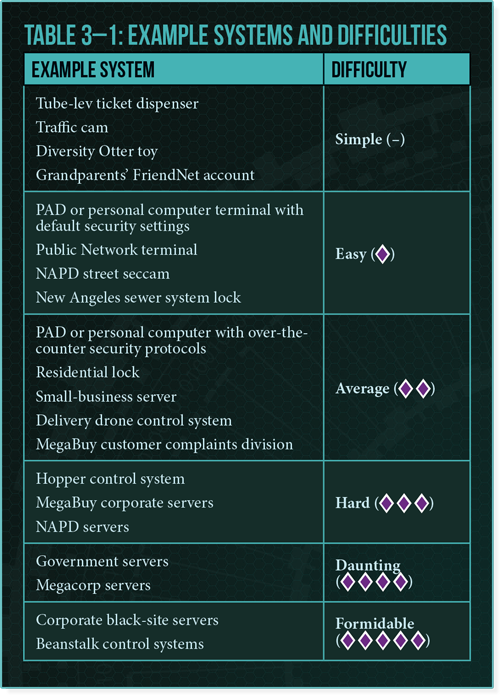 Once you access the system, not only is every sub-system revealed to you, but you also get to know which sub-systems are protected by ice—the powerful defenses dedicated to stopping malicious runners from accessing important sub-systems. You can see where the ice is, but you won’t know exactly what these pieces of ice are until you attempt access. An example system, detailing sub-systems and ice. Before you access the sub-system in question, you'll need to encounter the ice. These defensive countermeasures are powerful and offer a range of effects, from booting you out of the system, to alerting corporate sysops, to frying your brain. To prevent this, a runner must use an action to break the ice. Each piece of ice has a program strength, and the runner’s Break Ice action must generate a strength that exceeds the strength of the target ice in order to break it. To determine their own strength, the runner simply makes an average Computers check, with the number of successes determining their strength. Any runner worth their salt will be using specialized icebreakers, however, and if the runner has an appropriate icebreaker, they can add that icebreaker’s strength to their results. 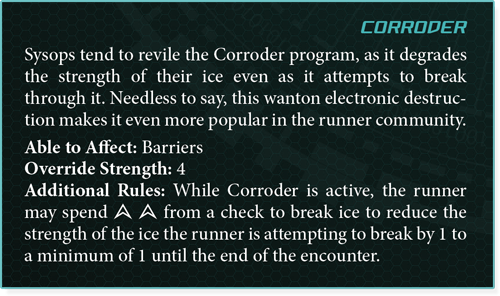 A runner can use the Activate Program action to make one of their icebreakers active, and each icebreaker can only interact with certain types of ice. 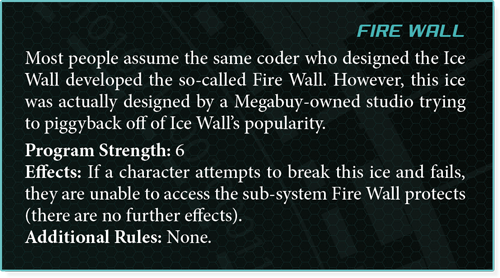 If you succeed in breaking the ice, it remains broken until the end of your next turn, and if you can break all pieces of ice protecting a sub-system, you gain full access! 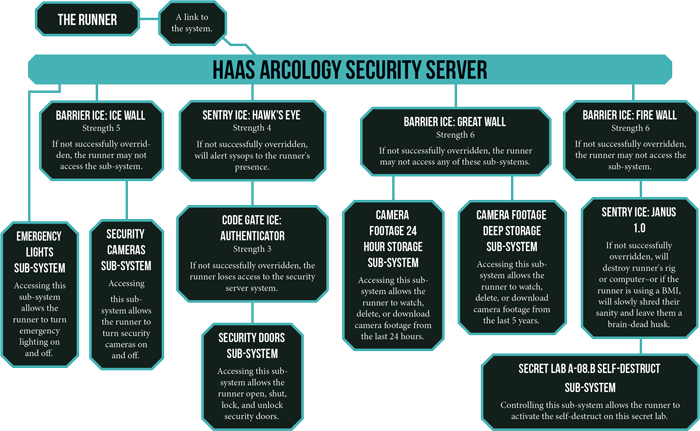 Naturally, if there are great quantities of ice protecting a server, it may require multiple runners or impressive talents to break, but heavily guarded sub-systems are often worth it. However, ice isn’t the only danger you’ll have to watch out for on the Net. Runners aren’t the only humans interacting with servers. Often, corporations will employ systems operators, or sysops: a runner’s polar opposite. Their job is to spot intrusions into systems, and once they do that, they need to track down the point from which the runner accessed the system and lock them out. They do this by utilizing two different actions: the Trace User action and the Lockout action. Tracing a user is an opposed check that sees the sysop pitting their Computers (Sysops) skill against the runner’s Computers (Hacking). 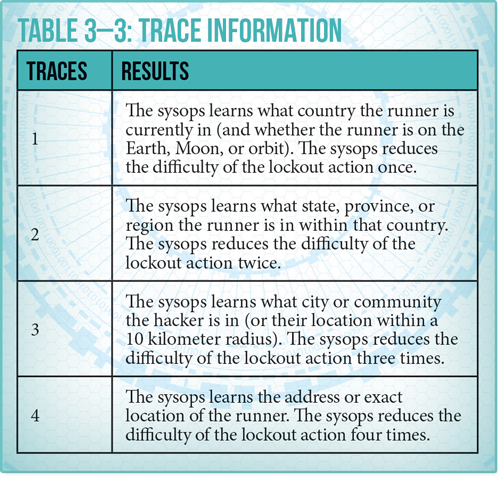 Should the sysop succeed, they gain one trace—the more traces a sysop has, the closer they are to discovering a runner’s exact location in meat space, and the easier it becomes to boot them out of the system. A Lockout action is available to a sysop once they're aware of a runner’s presence. With a formidable Computers (Sysops) check, they can kick an unauthorized user out of the system. Not knowing where the runner is makes this check extremely difficult, but the more traces a sysop has, the easier a lockout becomes. When a sysop knows exactly where a runner is, not only is it near impossible to stay in a system, but a runner can probably expect a visit from the NAPD in the very near future. And this is just the basic cat-and-mouse game between sysops and runners. Shadow of the Beanstalk also contains additional rules for runs that include ways to hide servers, or even burn rigs to the ground through the Net. The game of cat-and-mouse between the runner and sysop can be deadly, but the winner may find their pockets lined with enough credits to survive another day in the shadow of the Beanstalk. 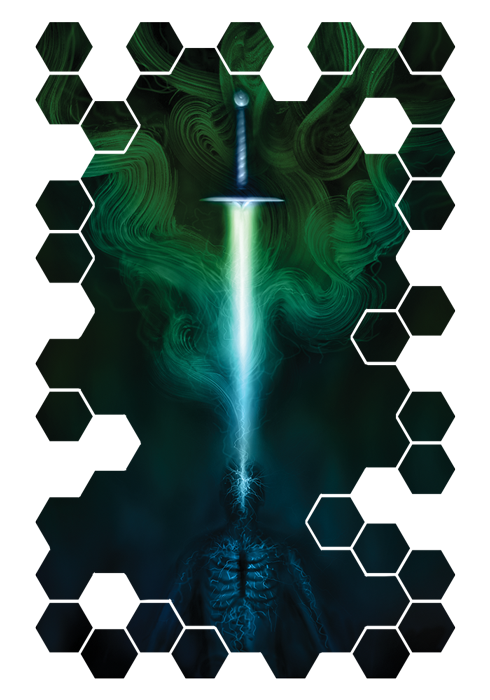 Will you dare to run the Net with the best of them, and survive with your mind and credits intact? Run the system with Shadow of the Beanstalk (GNS04), available now for pre-order form our Shop!